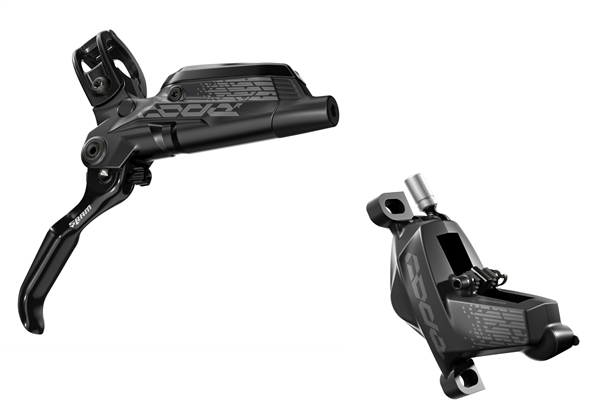 Product information "SRAM Code R Disc Brake - black"
Braking has many different meanings, but for Code it means being fast enough to win a downhill World Championship, or tackle the biggest alpine descents. Or shred a piece of singletrack uphill thanks to the new possibilities offered by E-MTBs. Code is the means to slow down for all those riders that like to ride harder, faster and with more intensity. It uses proven SRAM Guide design and technologies with a larger PiggyBack™ reservoir and 4 bigger diameter pistons in the caliper to provide consistent and reliable power for all heavy-duty applications. Bleeding Edge™ technology keeps maintenance as easy as it can be. Sleek, easy to use, yet immensely powerful. Code R packs a winning punch with a reliable DirectLink™ lever mated to Code's new oversized four-piston caliper. SRAM's signature ergonomics are supplemented by the tool-free reach adjust for a fit to each riders' needs, to unleash Code's superior braking power, consistency and modulation. Related links to "SRAM Code R Disc Brake - black"
Customer evaluation for "SRAM Code R Disc Brake - black"
Schwalbe Procore Double Chamber System 26"